The Nancy Thompson Memorial Library is more than just a place to store books. At the heart of the ACS campus, it’s a multipurpose room that hosts parent meetings, faculty meetings, receptions and student activities like Lewis Lunch Club and Destination Imagination. 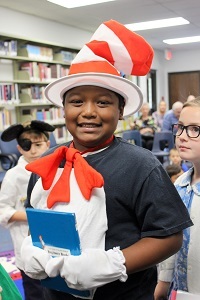 Elementary students visit the library each week for a storytime lesson and to check out books. The library offers many programs to encourage a love of reading! 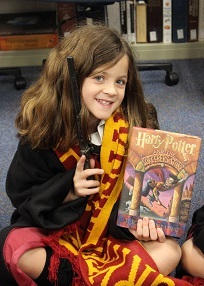 The Accelerated Reader Program is used to test 1st- 5th grade students’ comprehension on books they read. Points are earned based on test scores. At the end of the year, students can use their points to purchase prizes. Wade’s Word Club is our million word reader club. Kids who read one million words during the school year are acknowledged at chapel with a balloon bouquet and have their picture put up in the library. At the end of the year these students attend a special lunch with the school president and receive a gift card to a local bookstore. 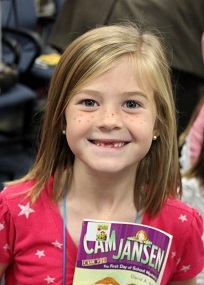 The Lewis Lunch Club is a program for first through fifth graders. Students are challenged several times a year to read a certain book within a month. Participating students are invited to attend lunch in the library at the end of the month and discuss the book in small, parent-led discussion groups. Middle school and high school students also enjoying using the library facilities. ACS Juniors and Seniors receive an ACU library card which gives them the privilege to use the library facilities at ACU. That includes the Interlibrary Loan Program, so they can access materials from all three colleges and the Abilene Public Library.